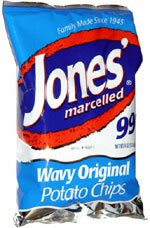 Jones' Potato Chips bag designs are not actually designs. They are just Potato Chips bags with the company name, the flavor name and color coding for that flavor name printed on them. The Snap Test was successful. The Chips snapped in half in both directions. The crunch was firm but muffled. The thickness of the Chips, along with the type of oil used perhaps, meant that there was minimal crunch for a relatively thick Chip. The munch was good, but there was nothing loud about it - it was a bit cracker like. Although these were regular cut they were thicker than most Wavy, or Rippled Chips. Most of the Chips were medium to small in size, but whole. The Ridges were wide and evenly spaced. There was potato skin and browning around some of the edges of what were otherwise fairly yellow and seasoningless Chips. These Chips are particularly high in saturated fat and also include trans fats, which most Chips manufacturers have done away with. The Nose Plunge Test revealed a pleasant warm and potatoey aroma. The taste could arguably be described as oily and unsalted, because the dominance here was very much the oily potato. It was however a nice, warm, comforting Chip, but for us at least, they needed a sandwich to give them purpose.